In case I hadn’t made it clear in some previous post, I love coffee. Mostly I love the rich flavor of a good espresso, but I won’t lie, I can’t go without my daily caffeine boost. I don’t often get coffee to go, but when the occasion arises, I come prepared with my own coffee cozy. 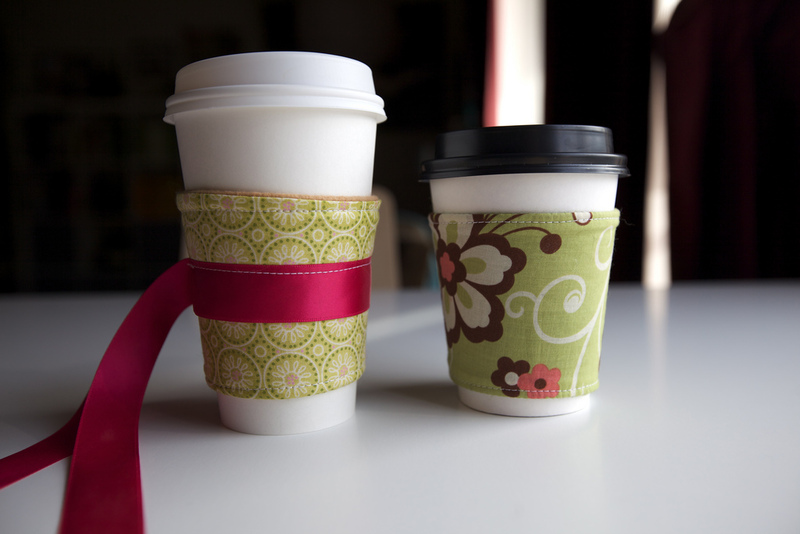 It’s not quite as earth friendly as bringing your own mug, but its much more convenient as I can carry one in my purse all the time. Not to mention, they’re damn cute. I made these one night after seeing some adorable ones on various craft blogs and knew I had to have one. I used some scrap fabric and some felt to line them. They came together in just a few minutes. Lucky for you…I’m including a tutorial on how to make one of your own AND giving away a cozy to one lucky reader. Better than an infomercial! 1. First print out the template I’ve included. 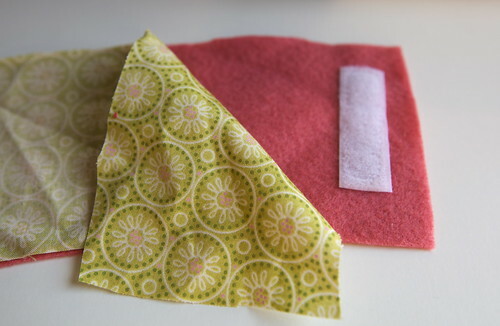 Use the template to cut two pieces of fabric for your cozy, one out of felt, and the other out of a fabric of your choice. 2. 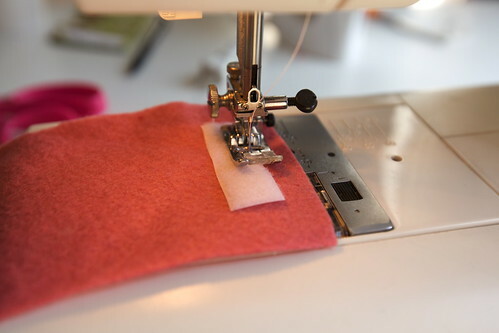 Next take a piece of velcro and sew onto one side of the felt, being careful to leave space for seam allowances. I should probably tell you now that I rarely pin things, mainly because I am lazy, but you might want to baste or pin pieces in place. 3. 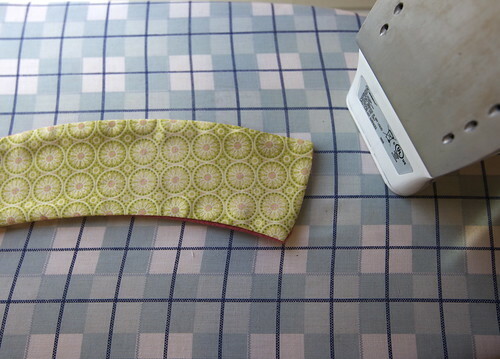 Put your two fabric pieces together with the right sides facing. The velcro will be on the inside. 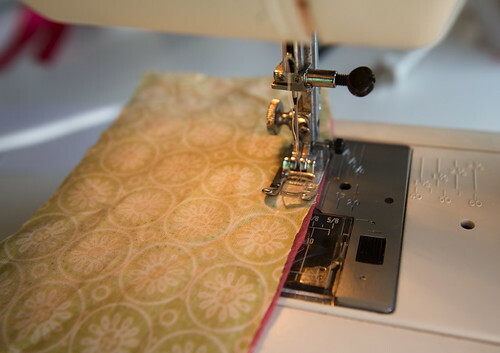 Pin if necessary and trim any areas where the fabrics do not line up. 4. Sew along the two long edges and the short edge near the velcro, following a 3/8 inch seam allowance. Make sure to double back and secure any open ends. 5. Turn the cozy inside out, using a chopstick to poke out corners. Fold the unfinished edge inside and press the whole thing. 6. Sew around the outside edge of the whole cozy starting on the unfinished side about 1/8 inch away from the edge. 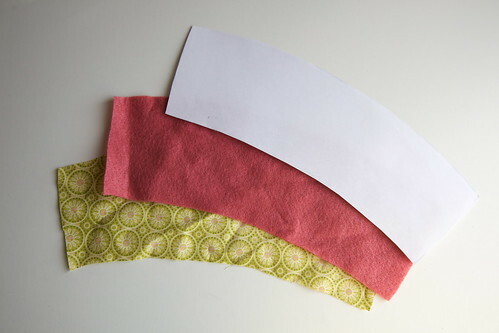 You can use a matching thread or something contrasting, depending on what you prefer. 7. Last, sew the other half of the velcro on the outside so that it will meet the velcro on the inside. That’s it! Good work, I think you deserve some coffee. If you like the cozy you see made in the tutorial, you can win it. All you have to do is comment and a winner will be chosen at random on March 7th. Good luck! Update: and the cozy goes to…Christy! Congratulations! My cup of coffee after some non-egg/meat/dairy food!! It doesn’t get any better!!! Ohhh, this is a neat idea! I never thought of it! i would love a cozy! i have a question: were you naturally good at crafts or did you have to get good at it? i did some crafts a while back, and am interested in picking it up when i have time! Wow! Those are so chic, absolutely adorable! How talented are you to make those yourself!?! I’m very impressed! Holy Shnikeys, those are so damn adorable! I would feel so superior to everyone around me pulling one of those out of my purse (ha, not really). Thanks so much for the tutorial! Those are awesome! I have never thought twice about cozies. I like your idea. They are gorgeous! And especially useful for people like me who occasionally order black tea and the cup is hot, hot, hot!! What a great idea!!!!!! I have to make one asap! That is so cute! Though I don’t drink coffee, my sister and mom do. I know they’d love that cute cozy. really a great idea! well done alix! This is the cutest thing ever! I always give back the cup cozy when I get tea because it’s a waste. This is so eco-friendly, next to bringing your own cup! Screw it, I’m getting in on this contest! I was hesitating to post a comment, since I’d really like to get a chance to make one myself… but let’s be realistic here. 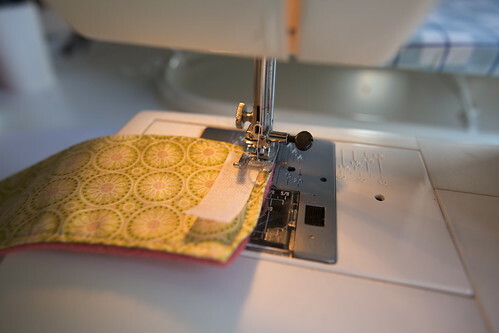 I’m still in the market for a sewing machine (who has the time to sew by hand? ), and once I get one, I promise to make cute things instead of just begging for yours! Honest!